Everyone’s favorite camera service special is BACK so you can give your gear the tune-up it deserves. 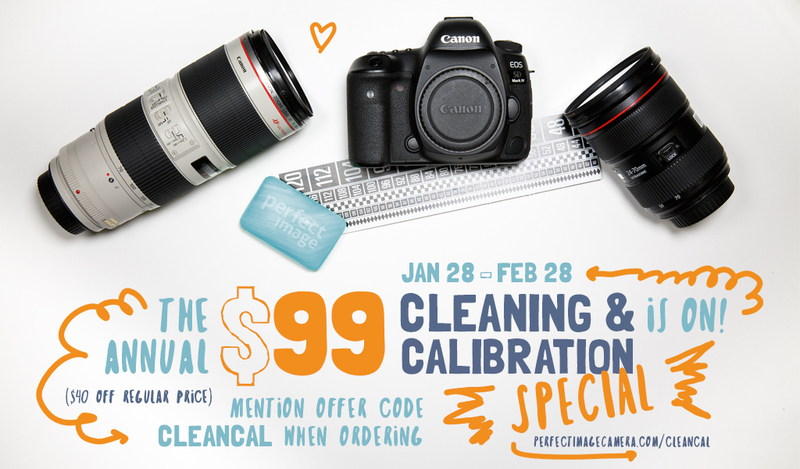 From January 28th – February 28th, drop off or ship us your camera and two lenses and get your camera’s sensor cleaned and both lenses calibrated for only $99*. That’s $40 off the regular price for this service! All cleaning and calibration services are normally completed within two business days. Sale ends on Wednesday, February 28th. Walk in orders are always welcome! Start your order using the calibration order form. Add a sensor cleaning on step 2 of the form. Use the offer code cleancal during checkout to take advantage of this offer. (or order online and ship) to take advantage of this special! Service Drop Off Location Outside the area? Order online! *Price does not include shipping or state taxes. Additional calibrations beyond the first two lenses are an additional $40 per lens. Offer only applies to equipment checked in, or tickets created online, in between specified dates, and does not apply to orders previously checked in or ordered online prior to offer start dates (January 28, 2019.) Offer cannot be combined with any other offers or discounts. Please note: Most entry-level models (such as the Rebel series of Canon cameras or the 3000 or 5000 series of Nikon cameras) do not have the micro-focus adjustment feature as an option and cannot be calibrated using this type of service. If you’re unsure if your camera has the capability to be calibrated, contact us and we’ll let you know!